Due to a flexible and cross-cutting approach, the urban project is emblematic of contemporary urbanistic concepts. Can this approach reconnect cities, ports and waterways? On the contrary, can it reinforce the disconnection under way, in a context in which the rationale of the market is more favourable to the sphere of residential economy than to the sphere of productive economy? This question is raised especially with respect to the canal area of Brussels, where major challenges intersect: urban densification in a context of demographic growth, the transferring of river freight as a sustainable alternative to the road network, and the improvement of water management. The aim of this article is to understand the evolution of the relationship between city and port via the interactions of the projects of the different stakeholders concerned. By means of a spatial and temporal approach, the results show that through their materialisation, the projects contribute to reproducing the functional divisions of the industrial era, caused by their economic environment. However, through their processes, new frameworks for a dialogue between city and port emerge. These observations provide some ideas for a reconnection between the city and its port. Le projet urbain, par la démarche souple et transversale qu’il produit, est emblématique des concepts urbanistiques contemporains. Cette approche peut-elle opérer une reconnexion entre villes, ports et fleuves ? A contrario, pourrait-elle renforcer la déconnexion en cours, dans un contexte où les logiques de marché sont plus favorables aux sphères d’économie résidentielle qu’aux sphères productives ? Cette question se pose particulièrement à Bruxelles, dans la zone du Canal, intersection d’enjeux majeurs : densification urbaine dans un contexte de croissance démographique, redéploiement du fret fluvial comme alternative durable au réseau routier et amélioration de la gestion de l’eau. L’objectif de cet article est de cerner l’évolution de la relation ville-port par les interactions entre les projets des différents acteurs concernés. À travers une approche spatio-temporelle, les résultats montrent que via leurs matérialisations, les projets participent à reproduire les coupures fonctionnalistes de l’ère industrielle, causées par l’environnement économique dans lequel ils s’inscrivent. Par contre, à travers leur processus, de nouveaux cadres de dialogue ville-port apparaissent. Ces constats fondent quelques pistes pour une reconnexion de la ville et de son port. Wat het stadsproject zo kenmerkend maakt voor de moderne stedenbouwkundige concepten, is de soepele, transversale aanpak. Kan zo'n aanpak een herkoppeling van steden, havens en rivieren teweegbrengen? Of zal die de huidige ontkoppeling net versterken in een context waar de marktlogica gunstiger is voor de wooneconomie dan voor de productieve economie? Deze vraag is vooral prangend in de Brusselse Kanaalzone, op de kruising van grote uitdagingen: stedelijke verdichting in een context van bevolkingsgroei, herontwikkeling van het riviertransport als duurzaam alternatief voor het wegtransport en verbetering van het waterbeheer. Dit artikel zal meer inzicht geven in de evolutie van de relatie stad-haven door de interacties tussen de projecten van de verschillende betrokken actoren. Op basis van een ruimtelijke en temporele benadering tonen de resultaten aan dat de projecten, door hun concrete invulling, bijdragen tot het overnemen van de functionalistische breuklijnen uit het industriële tijdperk, die teweeggebracht werden door het heersende economische klimaat. Uit het projectproces ontstaan echter nieuwe kaders voor dialoog tussen stad en haven. Die vaststellingen vormen de basis voor enkele denkpistes met het oog op de herkoppeling stad-haven. 1The connections between cities and inland ports are both diverse and complex. Along the water, different landscapes appear: sometimes industrial, sometimes urban, sometimes natural, or hybrid and in the process of being deserted or transformed for other uses. These territories – which are characteristic of significant functional as well as morphological fragmentation – are none other than the result of the relationship between the city and its port, whose history is marked by a gradual disconnection [Hoyle, 1989]. Today, these fragmented and hybrid territories are under the spotlights of different public and private strategies. Having experienced a symbolic depreciation due to the process of deindustrialisation, these spaces are arousing interest once again, but this time from different angles. 2They are much sought-after by urban stakeholders who wish to promote a return to city centres, under the aegis of projects aimed at reclassifying waterfronts. These actions take different forms, such as urban renovation operations, purely private property operations, or operations carried out in the framework of a public-private partnership for which the large areas of industrial wasteland served as an opportunity to create new parts of the city. Behind the reconquest of waterfronts, there is an aim to increase the density of city centres. In a context of growing territorial competition, the increased status of these places near the water seems to be a guarantee of reinforced identity and attractiveness. Attractiveness is a priority for these metropolises where the most well-to-do households – with a dual income – continue to leave the centres and the suburbs, preferring detached houses in the outlying municipalities. The Brussels public authorities and private investors see waterways from a new perspective, now considering them as a support or even as levers for urban development. Following the multiplication of private initiatives, the canal area in Brussels has been designated as the priority territory in the new strategic document for the Brussels region called the Regional Sustainable Development Plan (PRDD). The social risks related to the process of gentrification [Chaline and Rodrigues Malta, 1994]. 4Inland ports in an urban environment are not only subject to a high degree of land pressure from other urban activities on their property, but they also attract the interest of port stakeholders as regards the transferring of river freight, whether it is via the traditional sectors of inland ports such as the transport and storage of bulk materials (construction materials, hydrocarbons, grains), concrete plant activities, or new sectors such as waste transport, urban logistics or containers. In support of environmental arguments, the port stakeholders promote the transferring of river freight, providing an alternative to the road network. Encouraged by European support for intermodal initiatives, waterways nevertheless compete with road freight transport. As roads are more adapted to extreme time pressures, they currently prevail over the other modes (including waterways) in the modal split between port traffic in most inland ports in Europe. 5From an economic point of view, the stakeholders in the sphere of industrial port activities put forth the argument that these activities create a significant number of jobs for low-skilled workers. Finally, within the globalised economy, inland ports are also positioned with respect to the increasing role they play in logistics matters. Their location – which is close to consumers and to the interface of waterway, land and sometimes rail systems for the distribution of goods – makes them key stakeholders in ensuring the link between mass logistics and urban logistics. Thus, the creation of logistics areas and urban distribution centres has emerged in many European inland ports, sometimes as part of innovative concepts aimed at the combination of these two nodes in a global supply chain. Concerned about their integration in the region they serve, ports encourage the development of sectors such as the transport of household waste or construction materials. In Brussels, port jurisdiction – which was transferred to the Brussels-Capital Region in 1993 – involves the establishment of these activities in the administrative boundaries of this city-region. This constraint may however be seen as an opportunity to integrate port operations as closely as possible to consumers, thus limiting the number of kilometres at the end of the supply chains, which are usually covered by lorry. 6Furthermore, these spaces along the waterways are presently involved in new water management policies, extended to the level of the catchment area. From a hydrological perspective, the new legislative approach, introduced by the European Union in 2000 with the adoption of the Water Framework Directive (WFD), is not based on national borders or policies, but rather on natural geographical and hydrological formations: the catchment areas or watersheds. Bordered by crest lines, these areas drain all of the rainwater and spring water towards a body of water, a stream or the sea. As the geographical unit which the analysis of the hydrological cycle and its effects is based on, the catchment area is now becoming the unit which water management policies are based on. In Belgium, water management – a regionalised matter – leads to various situations according to the region. For example, the Brussels-Capital Region integrated this new situation late, through its water management plan adopted in 2012. Furthermore, these new water management policies are often not only intended to protect and promote natural heritage. They also tend to favour the recovery of the banks by the population, with the creation of new natural spaces and walking circuits. In the process, they tend to reconcile the city with the water. This is the philosophy of the Brussels-Capital Region for example, through its Maillage Bleu, associated with the Maillage Vert, launched in 1999. Behind these environmental concerns, there is often a will to bring nature back to the city via the use of the waterway in the city. The waterway serves as a medium for the organisation of events, such as Bruxelles-Les-Bains or Festival Kanal organised by the citizen movement Platform Kanal. 7These spaces at the interface of the city, the port and the waterway appear to be under pressure from different interests. Centres to be concentrated, goods transportation nodes to be built up, catchment area to preserve? How do these different approaches confront one another? What roles do the current urbanism tools play in the management of these potential conflicts? And in particular, does the project as a recent mechanism for action in the city allow a connection between these different facets of the territory? This article examines the capacity of the urban project, as a method of urban development, to reconnect cities, their waterways and their ports, functioning in a compartmentalised manner since the industrial revolution. 8Beginning in the 1970s, the urban project appeared to be the new mode of action and transformation of the territories. It was the result of the influence of economic and management tools focused on the concepts of flexibility and versatility. While it is difficult to define the outline of the urban project because its indeterminacy constitutes its main quality [Ingallina, 2001; Pinson, 2009], we may, however, clarify this notion through the impact it has on the evolution of the planning process. 9In a context of growing uncertainty regarding available resources, horizontal relationships multiply to ensure a capacity for action, thus generating new alliances of stakeholders from groups and institutions. In this framework, the project proposes a cross-cutting and global approach, in opposition to sectoral logic, in the sense of the fragmentation of urban tasks and functions, and the sometimes watertight relations between stakeholders [Avitabile, 2004]. 10This position with respect to former development practices dominated by standard planning leads to a variant of the notion of project, which is centred more on its political side than on its technical side [Ingallina and Roncayolo, 2003]. 11The process – the proposed co-production approach – therefore becomes the foundation of the legitimacy of the plan of action for the project, whereas the plan had more value due to the unequivocal scientific validity of the expertise, which allows it to get under way. The project process is iterative at several levels. Firstly, the dividing line between the conception and execution phase tends to become blurred, as the definition of the project is sometimes re-evaluated and adapted according to the evolution of the context. Next, the spatial and temporal hierarchy, characteristic of planned urbanism – which subordinated the planning documents established on large scales for the distant future to those established on smaller scales for the near future – tends to diminish with the project approach. It favours an iterative enrichment between these different scales, with one nurturing the other through gradual adjustments [Pinson, 2009]. 12This change in the methods of planning the city also involves an evolution in the related trades. While experts continue to play a crucial role in the elaboration of scenarios, today this involves mobilising stakeholders in a project, with these studies becoming a support for dialogue and not the firm expression of the outcome of the elaboration process behind urbanistic choices [Ascher, 1995]. 13Project urbanism also responds to the growing challenges of attractiveness, competitiveness and communication in urban policies. The development of waterfronts is emblematic of these (London, Hamburg, Lyon, Bordeaux). In a competitive context in cities, they promote an identity and a singularity with respect to the water, and represent great potential for media images. By focusing on certain operations, the singular architectural objects, the emblematic and visible projects and the communication which accompanies the realisation of the project are thus aimed at ensuring that the renewal of the urban space is “well received” and, as it were, effective [Söderström in Bailleul, 2008]. 14In this context of sought-after spaces, do these new forms of collective action truly allow this competition between urban, port and hydrological functions to be overtaken by the creation of new forms of functional mix? Can this approach reconnect cities, ports and waterways? On the contrary, can it reinforce the disconnection under way, in a context in which the rationale of the urban market is more favourable to the sphere of residential economy than to the sphere of productive economy? The impact of the project approach on the evolution of the relationship between city and port will be examined in terms of the hypotheses of reconnection and disconnection. 15In the competitive context in which the return of the city centre is one of the challenges for cities, property pressure exists in the active port areas outside the centre. This is spurred on further by the operations to renew industrial wasteland and infrastructures in areas outside the centre, contributing to the centripetal effect of the process of metropolisation. This heralds the next cycle, which is part of the prolongation of the disconnection between the city and the port. 16The disconnection hypothesis is reinforced if – following Genestier’s analysis – the project is the sign that urbanism is subjected to the market, “determined above all else by an unequivocal and stereotypical image of the city”, marking a tendency no longer to become “a series of accompanying measures for local development dynamics” [Genestier, 1993]. In this case, the disconnection between city and port would be prolonged and would take place quickly, due to the difference in land income, which favours residential, facility and service functions or which is more specifically centred on recreational and cultural functions, to the detriment of productive and port functions. Moreover, according to G. Pinson, while “the project processes have the common characteristic of excluding both the challenges and the groups which are likely to break the project’s consensual mechanism”, the relocation of port sites to areas outside the urban centre may ensue. Once again, this transfer would lead to the exclusion of port sites from the reflection process for areas outside the centre, due to the diverging representations and interests of these two spheres [Pinson, 2009]. 17Several major changes could, however, indicate a new direction for the relationship between city and port, in favour of a reconnection, or at least the implementation of a better connection between these two spheres. 18According to J. Debrie, the conjugation of new urban challenges (reclassification of waterfronts, redistribution of river freight, new water management policies) involves the construction of a dialogue between the different stakeholders, thus marking the end of a disconnection between city and waterway and the establishment of an interaction between stakeholders negotiating the terms of this new relationship. The emergence of this dialogue is the result of a morphological question centred on the opportunities provided by port property in the framework of a reduction in available land resources due to urban development. Extended into institutional frameworks, this dialogue materialises in the emergence of the waterway issue in the elaboration of different planning tools, covering different areas of development at different scales [Debrie, 2014]. 19Next, the evolution of ideas and practices related to urbanism leads to the awareness “that it is now necessary to work in a cross-cutting perspective, on the part of administrators (decompartmentalisation of the different municipal services) as well as professionals (multidisciplinary teams)” [Ingallina, 2001]. 20Finally, transformations in the structure of city-port governance, in particular through the processes of port decentralisation which have taken place or are under way in various European countries, could lead to a renewal of the city-port dialogue through the geographical proximity of the new port authority and the administered territory [Lavaud-Letilleul, 2010]. 21In order to test these two research hypotheses which question the shift of the project approach on the evolution of the relationship between the city and the inland port, we have chosen two sites: Tour & Taxis and Biestebroeck, located along the canal which goes through the Brussels region. 22The choice of sites was determined by three criteria. These spaces are part of the recent process of territorial changes, at the crossroads of the deindustrialisation and urban renewal movements which have turned these spaces upside down in recent decades. Furthermore, they are the location of urban projects and the port. In order to favour a multiscale analysis, these projects had to have a regional scope. Finally, both of the sites bring together land opportunities equipped with remarkable industrial architecture along the waterway, with active port sites which are used mainly for transport activities and the storage of construction materials. While industrial wasteland and infrastructures provide opportunities to develop mixed programming (habitat, public spaces, facilities, shops, offices, etc. ), port sites offer the possibility to improve urban logistics through the flow of goods as close as possible to the urban centre. The location of these sites in their urban area, the projects under way, their perimeter, their timescale and the stakeholders are described below. 23In order to analyse these case studies, we have created a method with a spatial and time-based approach. The underlying objective was to understand the evolution of the production process of a territory through the interactions between the projects of the different stakeholders concerned, leading up to their abandonment, modification or annexation. 24A first aspect concerns the scopes of action. How are these actions structured in their spatial dimension? Are they juxtaposed? Do they overlap? Are they integrated? Are the projects structured as systems? Can we speak of a city-port system or of a city system on the one hand and a port system on the other? In order to analyse the role of the project approach in the evolution of the relationship between city and port, its influence on a possible prolongation of their disconnection, or on the contrary, on the beginnings of a reconnection, this first angle of analysis consisted in spatialising the actions of the stakeholders concerned with the future of the chosen city-port interfaces. To this end, summary mapping tools referred to as a mapping of the evolution of projects were made for three interface areas. They show the progress of urban and port projects at three moments t (2002, 2007, 2012), over a period of 10 years. For each moment t, each site – mapped on a local scale of the neighbourhood (figures 2 and 4) – is also shown with respect to the changes in the broader environment of the urban area (figure 1). 25A second aspect considers the time factor: the timetable for action. How do the actions materialise? How do these actions interact over time? Are they coordinated? On the contrary, is the time factor used to legitimise certain actions and exclude others? A second angle to understand the territorial changes was centred on the anticipatory actions accompanying the projects, aimed at their legitimisation. In order to do this, figures called General chronology of the relations between projects (figures 3 and 5) were created for the two key areas. 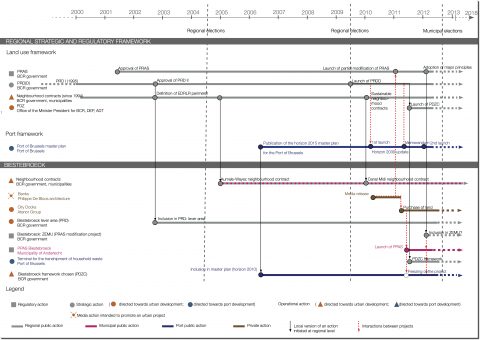 In order to make these chronological maps, the urban and port projects were placed horizontally on a timeline, from their launch until their possible adoption. Vertically, they were structured according to a geographical scale. The project owners and the types of action initiated by them were indicated: media, strategic, regulatory or operational. 26The results obtained from this methodological itinerary show that through their materialisation, the projects contribute to reproducing the functional divisions of the industrial era, caused by their economic environment and the internal conditions of their design framework. 27On the other hand, the results are more mixed as regards organisational logic, an aspect which has been explored in depth in the thesis “Villes et ports fluviaux : le projet comme dispositif de reconnexion” [Mazy, 2014]. Centred on the forms of dialogue and cooperation in the urban and port spheres (city-port mode of governance and local project process), the analysis shows that through its process, the project allows the foundations for a new city-port dialogue to be laid via new forms of horizontal cooperation. 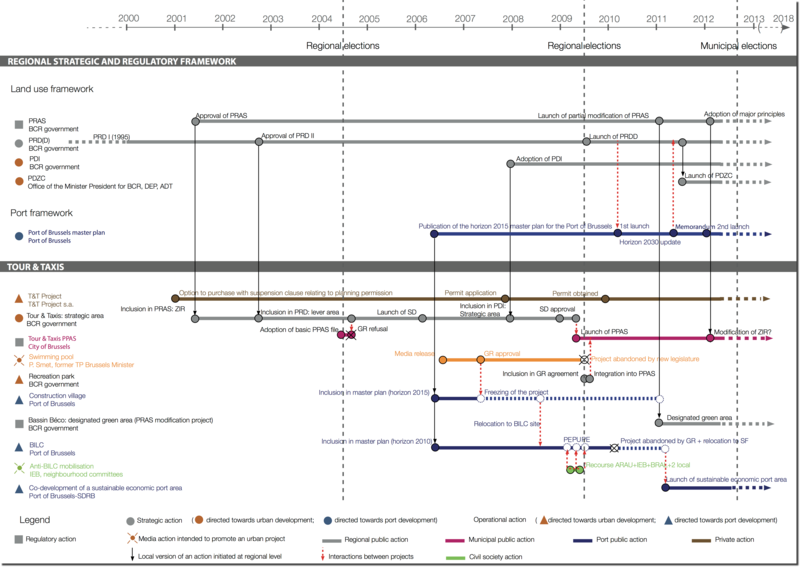 28The spatial and time-based analysis of the changes in city-port interfaces shows that the introduction of the project approach does little to promote a reconnection between city and port. It even tends to accelerate the process of disconnection. The comparison of the two analytical tools used – namely the mapping of the evolution of projects and the general chronology of the relations between projects – allows us to sketch out the spatial and time-based aspects, as well as the forms of action which embody this disconnection. Furthermore, the analysis of two case studies on two scales – the local scale of the project and that of its surrounding urban area – shows the general trends and the various forms. 30In 2002, strategic planning marked the pursuit of the revitalisation of central neighbourhoods. Extended beyond the limits of the largely rehabilitated historical centre, it now encloses the most vulnerable neighbourhoods adjacent to it. In parallel, it is beginning to define the hubs outside the centre whose change is a matter of regional interest. These aspects are seen with our two key areas. 31The Tour & Taxis and Biestebroeck sites are located in the Espace de Développement Renforcé du Logement et de la Rénovation. 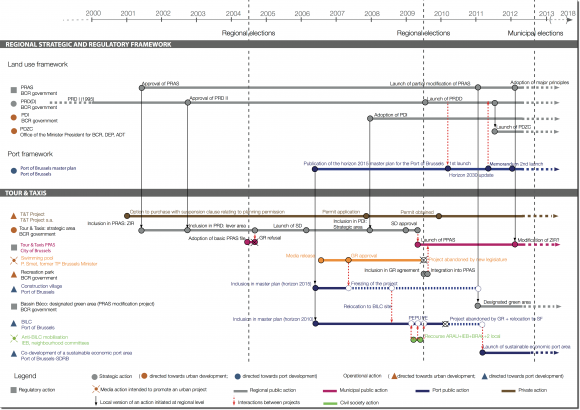 As part of the strategic plan of the Brussels-Capital Region – the 2002 Regional Development Plan (PRD) – it pursues the rehabilitation policy initiated at the end of the 1970s, which was then broadened to a revitalisation policy at the beginning of the 1990s. This consists primarily in the establishment of neighbourhood contracts. Directed towards the most run-down neighbourhoods where the most socioeconomically vulnerable populations live, it is first concentrated around the central neighbourhoods and then extends along the canal. In parallel, the Tour & Taxis and Biestebroeck sites are listed as a Lever Area in the PRD. These Lever Areas are defined as areas requiring special attention and strong coordination of interventions, considering their problematic situation and their development potential. To this end, the PRD recommends that the development of these areas should be studied beforehand via a masterplan in order to establish the major options of intervention which must control their development. From the renewal of historical centres, strategic planning aims in parallel at the multipolar development of decentralised sites, the locations of future urban projects. The Regional Designated Land Use Plan (PRAS), adopted in 2001 by the Brussels regional government, had furthermore already given legal force to the Tour & Taxis site when it was listed as an Area of Regional Interest (ZIR), defined with the aim of allowing the reurbanisation of large areas of urban wasteland, developing new urban areas or rehabilitating buildings which benefit from heritage protection. While the ZIR – which concerns the infrastructural wasteland – does not include the port site located to the north of it, the widened perimeter of the Lever Area incorporates it. 32Five years later, in 2007, the declaration of strategic hubs as new urban centralities was confirmed and clarified. At the same time, the port authorities responded by presenting their port development schemes. 33Tour & Taxis and its perimeter once again extended to the North neighbourhood, located on the opposite bank, became a Strategic Area of the International Development Plan (PDI), a document of intentions of the Brussels regional government, presented in 2007. 34At the same time, in parallel, strategic port documents emerged. The Masterplan of the Port of Brussels was presented in 2006. It planned for a logistics centre north of the Tour & Taxis wasteland – the BILC – and, on its west side, the Construction Village, a multifunctional site for the sale of construction materials, designed with an urban integration focus. 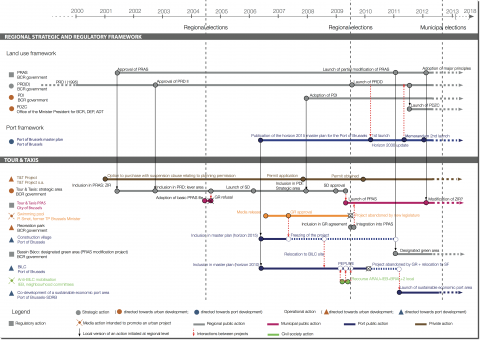 35In Brussels, a Priority Intervention Area (ZIP), defined in the framework of the European structural fund ERDF, continues the revitalisation efforts in parallel, via economic development aid projects. Its perimeter, centred and widened along the canal, prefigured somewhat that of the masterplan for the canal area, which heralds the last phase in the process of a ‘return to the centre’, which is part of the wider process of metropolisation. 36The extension of the urban centre takes the form of a blueprint or a masterplan, building on certain hubs defined in the previous phase in order to begin an extension of the centre. The waterway is used there as a vector of urban development as well as a common thread intended to draw the outline of a new central territory where the aim is to bring together a large number of isolated operations. 37In 2012, following the reinvestment in urban centres and the definition of outlying strategic hubs, the third aspect of this political objective involving a return to the city seems to have resulted in the definition of a widened area around the centre, which builds on the strategic hubs and is structured around the waterway. Its scope now covers the port sites outside the centre and leads straight to the debate on their future. 38In Brussels, this debate emerges in the framework of the elaboration of the masterplan for the canal area. This masterplan is aimed at “supplementing and clarifying the regional strategic document, the Regional Sustainable Development Plan (PRDD), on a more detailed scale which is rooted in the reality of the territory and the urban and socioeconomic fabric”. This shows the signs of a turning point from plan urbanism to project urbanism. 39Firstly, the search for constant iteration between the meta-project and the local projects structures the methodology chosen by the team entrusted with the elaboration of the masterplan, constituted by the joint venture between Alexandre Chemetoff et associés, Idea Consult and Ecorem. 41The local level allows a more rapid move from strategic lines to operational aspects. This objective leads to two means of action, which are also distinct from the classic planning approach and move towards project urbanism. On the one hand, there is the need to create a regional domain. This need was reinforced since the regional project was not clear as regards the future of the canal area. This plan therefore probably responded as a priority to the need to elaborate a vision between public stakeholders facing the private dynamics at work.2 On the other hand, a period of accompaniment for project implementation has been provided for. Moreover, this demonstration project approach avoids the pitfall of thematic compartmentalisation. This allows, in particular, the debates on city-port structuring to be identified and to begin from the moment of diagnosis [Alexandre Chemetoff et associés, 2012]. “The autonomous port land should become regional property. The autonomy of the port does not allow a harmonisation of development policies and projects and does not allow the successful integration of port functions in the city. We believe that port activity must be re-evaluated and find its place at the heart of the contemporary city. We do not feel that it must leave the centre to make room for the city. We support the idea of new mixes between this activity and the other functions, such as housing, facilities and recreational spaces” [Alexandre Chemetoff et associés, 2012]. 43This last aspect seems to entail at least three risks which could prolong a disconnection between the city and the port if they are not anticipated by the public authorities. 44Firstly, the promotion of the idea of new mixes is not accompanied by regulatory and legal measures which would guarantee the port area, as the method is not intended, “via a planning regulation or programme, to render the content of the canal plan as a planning strategy, but rather to develop and reorientate the projects under way” [Alexandre Chemetoff et associés, 2014]. 45Secondly, another reality which favours the disconnection between city and port is the change of status from industrial or port areas to mixed areas. For example, since the entry into force of the demographic Regional Designated Land Use Plan (PRAS) on 29 November 2013, Biestebroeck has been an area of companies in the urban environment (ZEMU), allowing the establishment of companies and housing. These changes in use could lead to a gradual disappearance of these functions. “Faced with an increase in rental values related to reclassification, the operation costs increase and company profits decrease” [Lonchambon, Petitet and Schmit, 2010]. Thus, according to the Brussels observatory of productive activities, the port lost 18 % of its surface area between 1997 and 2011, considering the conversions towards other uses, new implantations and extensions on the existing sites. This phenomenon is not specific to the Belgian capital [see, for example, Bartholeyns, 2010]. 46Finally, this approach – which favours the local level and the short term – does not relate to the port strategies, which involve the port hinterland and investments amortised in the long term. 47These changes show all the more the affirmation of a city system juxtaposed with a port system. The process of a return to the centre – put into movement by the urban sphere – and the port development projects evolve in parallel, by using distinct spatial development methods. While urban changes take place at several levels of action – a revitalisation of central neighbourhoods, multipolar development of sites outside the centre and an extension of the urban centre – port development takes place via a network of specific projects. Confirming the first research hypothesis – that of disconnection – we shall see in the next section that the juxtaposition of these strategies occurs at local level through the abandonment, relocation and freezing of certain port projects. 48These compartmentalised actions between the urban and port spheres create friction in the interface areas between city and port at local level. It is therefore at this level that the evolution of the relationship between city and port is renegotiated. They are particularly pronounced when the development of a hub of regional or metropolitan interest – most often structured around wasteland and remarkable industrial buildings – triggers a process of urban change, leading to the creation of a system of urban projects enclosing the port activity sites. 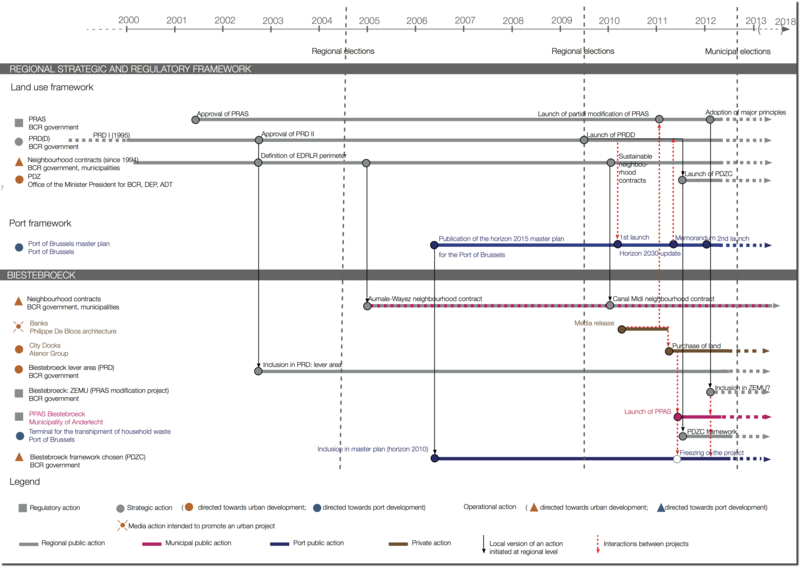 In the two cases studied, the comparison of the mapping of the evolution of projects (figures 2 and 4), carried out on the scale of the site for each case study, and the general chronology of the relations between projects (figures 3 and 5) allows us to conclude that the system ends up excluding, freezing or relocating the remaining port activity sites. 49For example, one of the interface cases involves the left bank of Bassin Béco, located near the Tour & Taxis site, constituting a regional strategic hub. At first, the bank was supposed to be the location of the Construction Village planned by the Port of Brussels through its Masterplan. It is a multifunctional site for the sale of construction materials, designed with a focus on urban integration. This project encountered two obstacles as defined by P. Subra (2007): the effects of sought-after development, together with the effects of rejected development (figures 2 and 3). 50A few months after the publication of the Masterplan, the mayor of the City of Brussels and the minister in charge of public works for the Brussels-Capital Region announced an open-air swimming pool in the same section of the bank. The project was therefore relocated to another port site north of Tour & Taxis, being added to one of the flagship projects of the Masterplan, the BILC – a logistics centre. 51The new majority after the regional elections in June 2009, formed by a new coalition of parties, changed everything. On the one hand, it marked the abandonment of the swimming pool project, led by the minister in charge of public works, whose party – SP.a (Flemish socialist party) – was part of the opposition. This rejected media project nevertheless marked a turning point for this site from a port future towards an urban future, as the new majority announced the creation of a recreation park in its government agreement. On the other hand, under the pressure of residents’ associations and neighbourhood committees, the new majority ratified the relocation of the BILC to the Schaerbeek-Formation site, which presented more potential for intermodality. The relocation of the BILC to the north of the urban area did not give rise to the same fate for the Construction Village. In April 2016, the Construction Village saw the light of day along Bassin Vergote, north of Bassin Béco, chosen initially as the location of the site. 52As regards the PPAS, after six years of planning, it took a first step with its adoption by the Conseil Communal in December 2016, before its final adoption by the government. The anticipated difficulty to come to an agreement between public stakeholders (municipal, regional) and private stakeholders regarding the balance between the urban functions, had excluded the port activities area north of the site from the outset, thus reproducing the industrial logic of functional division. The reason mentioned was the lengthening of the procedure brought about by this inclusion in the limits of the PPAS.3 The question of the relationship between city and port was in the shadow of other pitfalls, throughout this long decision-making process, such as the question of social mix, the distribution of designated residential, commercial and facility uses, the planned density and the consequences in terms of mobility, or the surface area allotted to the park. 53However, through the project processes, the beginnings of a new city-port dialogue emerged. Like other projects integrated in the Canal Plan, this project is monitored by a steering committee made up of representatives from the urban and port spheres (Office of the Minister-President, the Port of Brussels, the Société d’Aménagement Urbain, the chief architect and Bruxelles Développement Urbain). In particular, this committee will see to the optimisation of the concentration of economic activities on its site (to integrate activities in their urban and architectural context), dense multifunctional development, and the promotion of landscape and heritage elements. 54The second example concerns the Bassin de Biestebroeck, bordered on the left bank by a historical urban fabric, and on the right bank by an industrial fabric enclosed between the waterway and the railway. In its Masterplan published in 2006, the Port of Brussels proposed a terminal for the transhipment of household waste on the right bank. And, not to mention, the coalition of interests would be structured around an urban recapture of the waterfront. 55The process of change began with the media coverage, in March 2010, of a banks project launched online by an architecture firm. It was an “urban showcase”, similar to the American approach to the waterfront which includes a marina, shops, offices and luxury housing. One year later, this scenario materialised in less caricatured forms, under the impetus of two factors: the purchase of part of the land by the property developer Atenor, and support from the mayor of the municipality of Anderlecht who published a contract notice a few days later for the elaboration of a PPAS. The latter could allow a departure from the PRAS, indicating an urban industry area. As regards the Region, it did not expect to authorise the special dispensation but encouraged the project. In March 2012, a project for the partial modification of PRAS was adopted by the government, and has been in force since December 2013. Biestebroeck involves the creation of a new type of area which allows a functional mix to be considered in an urban industry area: an area of companies in the urban environment (ZEMU). 56This uncertainty regarding the future of industries and the port in this area outside the centre was fuelled by other large scale projects under way which were part of the change in this area of the region. This was the case with a new development under way on the site of the Abattoirs in Anderlecht, the Port Sud project centred on the creation of a discovery and innovation centre (Centre d’Interprétation), an area to accommodate companies, and the development of the south neighbourhood – a regional strategic area around the international railway station. Furthermore, the masterplan for the canal area had defined Biestebroeck as one of the six frameworks intended to be the locations of the demonstration projects. Its elaboration followed the PPAS guidelines closely, and was available for public consultation in September 2016. 57This plan maintains the port uses but they represent a small minority. They must be dedicated in particular to a transhipment platform, allowing the temporary storage of goods, as well as complementary logistics activities (grouping, repackaging, etc.). 59The respect of ratios reserved for industrial port activities (75% of productive activities in the ZEMUs, provided for by the PPAS) is essential in order to ensure their maintenance. This urban integration could contribute to an increase in land pressure on these functions which are vital to urban functioning, and are pulled, on the one hand, by the new possibility to create housing in the neighbouring industrial areas (in the framework of the ZEMUs) and, on the other hand, by the type of housing, which, for example, would not include social housing. 60Collin concluded from experiences of projects in maritime city-ports that “the main pitfall of the approach is to remain in the functionalism of the industrial era.” [Collin, 2003] Considering the projects from the perspective of their materialisation (morphological perspective of the territory), these projects reproduce the functional divisions of the industrial era. The construction of analytical tools such as the mapping of the evolution of projects and the general chronologies of the relations between projects has led us to conclude that the role of the project contributes to prolonging and confirming the hypothesis of the disconnection between city and port via the creation of a city system, enclosing and eventually excluding, freezing or relocating the remaining port activity sites. 61However, this aspect is differentiated according to whether or not port operations are integrated in the outline of the urban project. If it is excluded, through the case of Tour & Taxis, it appears that by not dealing with the question of limits promptly, the conflicts involving sought-after or rejected development – opposed to the port project – are emphasised. If it is integrated, following the example of the Biestebroeck site, the process is lengthened, but opens the debate and initiates a dual reflection. On the one hand, a reflection on innovative forms of development is set in motion, allowing the structuring of activities at local level. On the other hand, this local level of studies prompts the necessity to initiate, at meso level, a reflection or an updating of a coherent development of these multi-site ports: the role, the rationalisation and the optimisation of each area of activity in the city and the way in which they function with respect to each other. 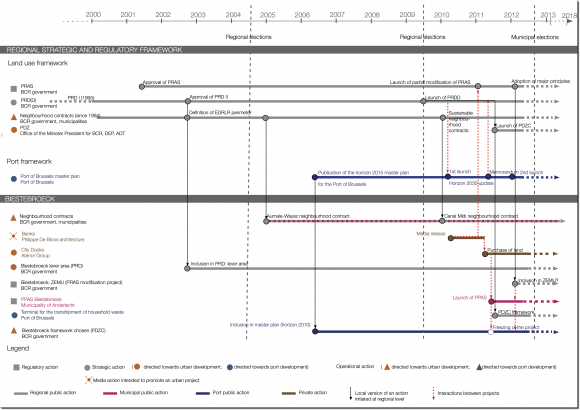 This is illustrated by the updating of the masterplan of the Port of Brussels, following the calling into question of certain local projects. In Paris, for example, the trend towards the specialisation of ports according to certain sectors has been shown by Paffoni. The choice of the type of specialisation depends on production requirements (where merchandise is created), distribution (the conditions in which merchandise must be transported) and consumption (where merchandise is consumed). Thus, the understanding of this evolution allowed Ports of Paris to redirect the functioning of its port sites, enhance their role and justify their existence [Paffoni, 2013]. 62The empirical approach, based on the analysis of methods for designing contemporary urbanism tools on different scales shows that the new forms of planning are marked by the search for iterative processes which are flexible and capable of creating new forms of horizontal cooperation, in order to adapt to uncertain conditions due to a greater dispersion of resources. 63However, at city-port interfaces, these mechanisms encounter difficulties in creating conditions favourable to a true reconnection between cities and inland ports. In the cases studied, they seem to reproduce the functional divisions of the industrial era. The materialisation of these projects leads rarely to the creation of true spatial versatility which could be a way to a better coexistence of the city and the port. Thus, in the framework of metropolisation processes, the declared will of cities to set in motion a return to the centre via different phases (the revitalisation of central neighbourhoods, the multipolar development of decentralised sites, the project to extend the urban centre) creates a context of uncertainty regarding the port areas outside the centre. In certain cases, the development of this city system ends up swallowing up port projects by leading to their relocation, their setting in a standby mode, and even their abandonment. But, to a certain extent, it also incites port stakeholders to reformulate or reinforce them, by joining additional forces. These difficulties could be due to the internal conditions of the project, but could also be caused by external conditions, such as the economic environment. In this framework, the city-port interfaces are also market commodities, assigned a value, evolving with the contact of two types of economy, namely productive and residential. The existing break between these two types of economy goes with the differing representations and rivalries regarding the future of these interfaces, and ends up prolonging the dichotomies between city and port which the project approach attempts – not without some difficulty – to transcend. the horizontal or plan approach aims to ensure the coexistence of the city and the port in a linear manner along the water. The reflection is programmatic and the reflection concerning the types of activity which are capable of coexisting is central in this case. the vertical or cross-cutting approach proposes a city-port structure based on layering through the use of double height. the differing use of space over time (day/evening; week/weekend) dissociates certain types of urban and port activity. A sharing of the space is therefore made possible by alternating the activities over time. For example, in Melbourne, a modelling of the different uses of water (port, recreational and sports activities, etc.) over time was first based on an inventory (Who? Which activities? At what time? Where? With which rights-of-way?). the forms of circular economy take place via a synergy between the urban, industrial and port stakeholders, by pursuing the objective to reduce incoming and outgoing flows (material, energy). The city of Rotterdam, for example, launched a pilot project in 2013 intended to link the port industry to the residential developments in the urban centre. The project consists in the construction of a pipeline intended to recover the steam emitted by the industrial companies to heat that part of the city. 65However, the conditions for a city-port reconnection do not only depend on technical or architectural innovations but must confront the three facets of the territory (morphological, organisational, existential). Upstream, an organisational reconnection concerns the evolution of the forms of city-port governance, in particular the frameworks for dialogue. In Brussels, the creation of the Canal Plan steering committee is an example of this. In order to preserve this fragile dialogue between city and port, a strong political will is necessary, involving at the very least the preservation of uses and the search for public land control. Downstream, a morphological reconnection concerns the new forms of development, the organisation of versatility in space and in time with respect to new forms of synergy based on circular economy. Finally, at the heart of this reconnection, the project process could play an essential role by basing itself, in cooperation, on the organisational facet via the mechanism for collective action which it establishes, on the existential facet via the representations of the territory which are the basis of negotiation challenges, and finally, on the morphological facet via the resulting spatial product which contributes to reshaping the waterway landscapes. ALEXANDRE CHEMETOFF et ASSOCIES, I. C., ECOREM, 2012. Plan Directeur Canal. Bruxelles: Région de Bruxelles-Capitale. ALEXANDRE CHEMETOFF et ASSOCIES, I. C., ECOREM, 2014. Plan – Canal 01. Bruxelles: Région de Bruxelles-Capitale. ANDERLECHT (Commune d’), 2016. Procès verbal de la réunion de la commission de concertation du 28 novembre 2016. ASCHER, François, 2003. Métropolisation. In: LEVY, Jacques and LUSSAULT, Michel (dir. ), Dictionnaire de la géographie et de l'espace des sociétés. Paris: Belin. ATELIERS LION + MSA, M. E., CITEC, BAS SMETS, 2008. Schéma Directeur, Zone Levier no 5 « Tour et Taxis ». Bruxelles. AVITABILE, Alain, 2004. Le projet urbain : une culture du territoire et de l'action urbaine. In : CHALAS, Yves (dir. ), L'imaginaire aménageur en mutation. Paris: L'Harmattan. BAUDOUIN, Thierry, and Collin, Michèle, 1996. L'après friches portuaires. In: Urbanisme, 291 (nov. déc. ), 24-32. BARTHOLEYNS, Christophe, 2010. L'enjeu de l'offre foncière économique, clé de transformation durable des territoires métropolitains. In: Etudes foncières, 148 (novembre-décembre). BIDOU-ZACHARIASEN, Catherine (dir. ), 2003. Retours en ville : des processus de gentrification urbaine aux politiques de revitalisation des centres (pp. 73-102). Paris: Editions Descartes et cie.
BUUR-ARIES and IDEA CONSULT, 2013. Biestebroeck - une vallée pour tous, PPAS Biestebroeck/ Phase 1A -Projet de masterplan et diagnostic. Bruxelles: Commune d'Anderlecht. CHALINE, Claude and RODRIGUES MALTA, Rachel (dir. ), 1994. Ces ports qui créèrent des villes. Paris: Ed. l'Harmattan. COLLIN, Michèle, 2003. Un nouveau mode de développement pour des villes productives. In: COLLIN, Michèle (dir. ), Ville portuaire, acteur du développement durable. Paris: l'Harmattan. DEBRIE, Jean, 2014. La relation ville-port dans les métropoles fluviales : quelle gouvernance ? In: BEYER, Antoine et DEBRIE, Jean (dir. ), Les métropoles fluviales, concilier aménagement et logistique pour un développement urbain durable, pp. 221-229. Paris: L'Oeil d'Or. DIRECTION ETUDES ET PLANIFICATION (Administration de l'Aménagement du Territoire et du Logement), 2012. Elaboration d'un Plan Directeur pour la zone du Canal en Région de Bruxelles-Capitale, Cahier spécial des Charges. Bruxelles: Région de Bruxelles-Capitale. ECSA and COOPARCH-R.U., 2013. Masterplan du Port de Bruxelles à l'horizon 2030. Bruxelles: Port de Bruxelles. GENESTIER, Philippe, 1993. Que vaut la notion de projet urbain ? In: L'architecture d'aujourd'hui, 288, pp. 40-46. HOYLE, B. S., 1989. The Port City Interface - Trends, Problems and Examples. In: Geoforum, 20 (4), pp. 429-435. INGALLINA, Patrizia and RONCAYOLO, Marcel, 2003. Projet urbain. In: LEVY, Jacques and LUSSAULT, Michel (dir. ), Dictionnaire de la géographie et de l'espace des sociétés. Paris: Belin. INGALLINA, Patrizia, 2001. Le projet urbain. Paris: Presses Universitaires de France. LAVAUD-LETILLEUL, Valérie, 2010. La décentralisation, facteur de recomposition des relations ville-port ? In : DEBRIE, Jean and LAVAUD-LETILLEUL, Valérie (dir. ), La décentralisation portuaire: réformes, acteurs, territoires. Paris: L'Harmattan. MAZY, Kristel, 2014. Villes et ports fluviaux: le projet comme dispositif de reconnexion ? Regards croisés sur Bruxelles et Lille. Thèse de doctorat en Art de Bâtir et Urbanisme. Bruxelles. Université Libre de Bruxelles - Université Lille I.
PAFFONI, Elsa, 2013. Renouveau du fluvial et dynamique métropolitaines, le cas des ports fluviaux franciliens (1980-2010). Thèse de doctorat, Université Paris-Est, Marne-La-Vallée. PINSON, Gilles, 2009. Gouverner la ville par projet. Paris: Sciences Po les presses. PORT DE BRUXELLES, 2011. Memorandum, 11 actions promouvoir dans le cadre de l'élaboration du Plan Régional de Développement Durable et de la modification du PRAS : le Port de Bruxelles, un port au service de sa région. Bruxelles: Port de Bruxelles. VERMEULEN, Sofie, 2015. The Brussels Canal Zone. Negotiating visions for urban planning. Bruxelles: Vubpress. VRIJE UNIVERSITEIT BRUSSEL, OFFICE REGIONAL BRUXELLOIS de L'EMPLOI, ECORYS and COOPARCH-R.U., 2006. Masterplan du Port de Bruxelles à l'horizon 2015. Bruxelles: Port de Bruxelles. 1 Interview conducted at the Département Développement Territorial of the Agence de Développement Territorial pour la Région de Bruxelles-Capitale, on 18 December 2012. 3 Interview conducted with the director of the consulting firm in charge of elaborating the PPAS, 26 April 2012.